Within a few minutes of the original Play for Today, first broadcast on 16 December 1975, we were introduced to some trademark Rumpole quirks and foibles. He quotes at length his favourite poet, Wordsworth, from Quiller-Couch’s Book of English Verse, refers to his wife, Hilda (Joyce Heron), as “She Who Must Be Obeyed” and wistfully recalls, as he will do so often in the years to come, his triumph as a young barrister in the Penge Bungalow Murders case. Rumpole, unlike John Mortimer who was a QC, never took silk. He never prosecutes and often takes on (and wins) apparently lost causes, when everything is against him from overwhelming evidence favouring the prosecution to quixotic judges who take a dim view of the barrister’s irreverent and down-at-heel charm. Mortimer saw him as “As crumpled fellow…always recovering from hangovers,” and “an Old Bailey hack,”2 which is also the way he was described in a review by Times theatre critic Leonard Buckley.3 The Play for Today story involves a stabbing at a bus-stop after an MCC-West Indies match at Lord’s. 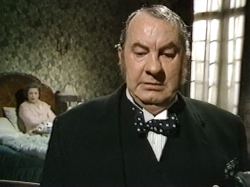 Rumpole is on a sticky wicket because the police have a confession from the teenage Jamaican boy he is defending, Ossie Gladstone (Herbert Norville). Gladstone is superficially impudent and full of himself; he is, in more recent parlance, “largeing it” about going to the Old Bailey’s number one court “where big cases go”. There are some interesting details in the handling of Gladstone’s race. When the youth is put in a cell already occupied by two old lags, one of them says: “Stealin’ off de melon patch?” A prison officer refers to Gladstone as a “picaninny” so casually that we are almost being tempted to see it as a Pavlovian response to a black skin, rather than a genuine desire to cause offence. But Mortimer is challenging these attitudes. Rumpole throws a barely perceptible glance at the officer which shows us that he is offended, as we should be. And this is confirmed by a voiceover in which we hear Rumpole repeat a thought he had expressed earlier in the play: “The Old Bailey blunts the sensitivity”. Rumpole is not letting the officer off the hook; quite the reverse, he shows us that this man is so insensitive, and his racism so deep-rooted, that he is prepared to racially abuse a black youth in front of his own barrister. It isn’t always easy to interpret correctly a writer’s sociological standpoint when examining a work of fiction which is more than a generation old. Playwrights were increasingly willing in the 1970s to address issues of race in stage and television drama, but it’s easy to infer both more and less than the writer intended. Ossie Gladstone is one of a group of youths, both black and white, who are present at the bus-stop stabbing incident. He is caught because he is no athlete, and by a long way the slowest to make his escape. Is it fanciful to suggest that this is a tongue-in-cheek riposte to racial stereotyping? Rumpole observes ruefully that: “If the judge turns out to be a Jamaican teenager with form we might have a chance.” But Ossie, who isn’t quite as cocksure as he would at first lead us to believe, does finally plead not guilty and win his freedom. Rumpole’s ultimate victory reveals his strange genius for uncovering truths which turn the cases on their head. He twigs that Ossie Gladstone is illiterate (adult literacy was not a subject that was aired much then, the BBC’s landmark On the Move programme first appeared the following year) and could not therefore have read out the confession he is supposed to have made. 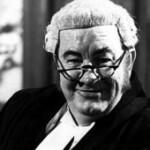 This was to be a recurring Rumpole storyline about defendants – an embarrassing revelation apparently causes them greater distress than the prospect of a spell inside. There were also plenty of opportunities for sardonic observations about the legal process, “everything,” as Leonard Buckley said, “from the nature of juries to the foibles of the Bench. We saw the horse-trading between counsel. We entertained grave suspicions about the police. We had the lot.” We also saw that “the heart inside [Mortimer’s] florid Rumpole was beating in the right place”.4 He is a man, in other words, essential to preservation of the ‘Golden Thread’ of British justice. Guilt must be proved beyond any reasonable doubt. Perhaps that early, dry run helped focus Mortimer’s thoughts on the sort of enduring character that he wanted to create. Seven years later, Rumpole hit the ground running. From the off, he was a character whose strengths in the courtroom appear to owe as much to instinct as intellect. Indeed, Rumpole admits as much himself, putting down to instinct his decision to pin down Detective Inspector Arthur (Edwin Brown) over the nature of Gladstone’s confession. The credits roll in virtual silence. Rumpole looks at some papers and mutters to himself, presumably regarding his next case. Mrs Rumpole mashes some potatoes. Both are dressed in beige. Even the fridge is beige. The camera explores their ghastly flat, with its washed-out green and grey décor. It is a very downbeat ending for a programme which is now remembered so fondly as amusing and light drama. Perhaps that didn’t encourage anyone at the BBC to really buy into Shubik’s enthusiasm for Rumpole. The play wasn’t previewed in the Radio Times of that week, and the same goes for The Listener, the corporation’s weekly magazine, which also failed to review Rumpole of the Bailey in the following issue. 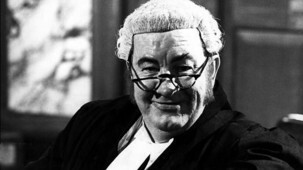 For all that, Rumpole of the Bailey required very little fine-tuning at Thames. The template had been created for a character who, like Sherlock, William and Bertie, will be with us 100 years from now. Originally posted: 19 November 2011. 24 November 2014: very minor typographical amendments; removed video; rescaled opening image. I’ve never been a follower of Rumpole, but I have seen this Play for Today, some time ago. Wasn’t the situation with the abandoned BBC commission that Irene Shubik was not to be allowed to produce it herself, as she was a Plays producer and any Rumpole series would have to be handled by the Series department?